U.S. Vice President Mike Pence, center, addresses a meeting on Venezuela in the United Nations Security Council at U.N. headquarters, April 10, 2019. 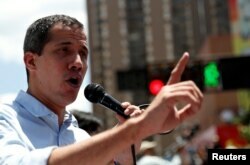 FILE - Venezuelan opposition leader Juan Guaido, whom many nations have recognized as the country's rightful interim ruler, attends a rally against Venezuelan President Nicolas Maduro's government in Caracas, April 6, 2019. 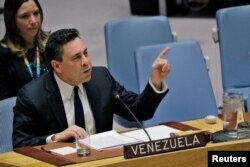 FILE - Venezuelan Ambassador to the United Nations Samuel Moncada speaks during a meeting of the U.N. Security Council on Venezuela's electoral and humanitarian problems at U.N. headquarters in New York, Feb. 28, 2019.